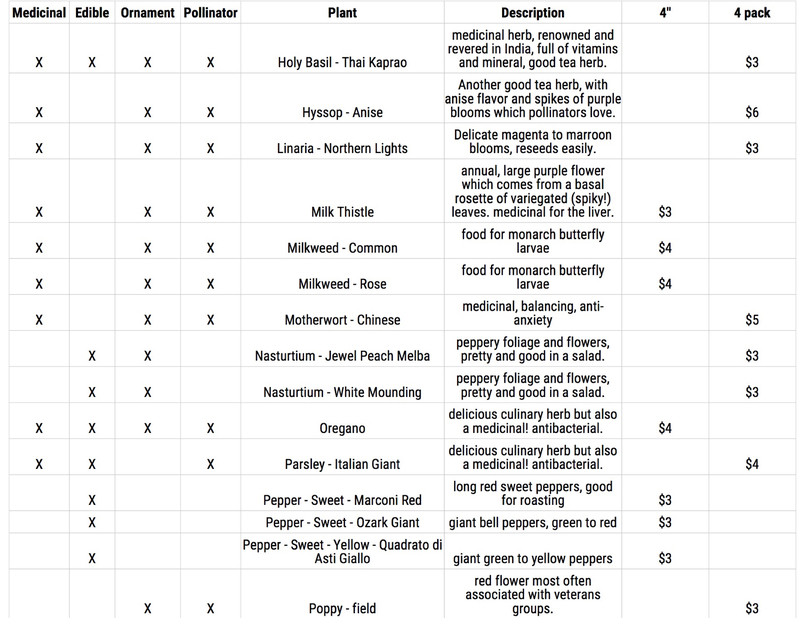 Plant Availability as of 5/26. 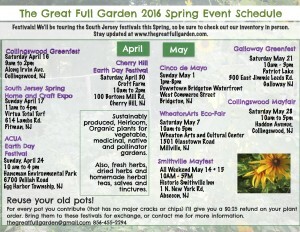 On Saturday, 5/28 I’ll be at the Collingswood Mayfair. 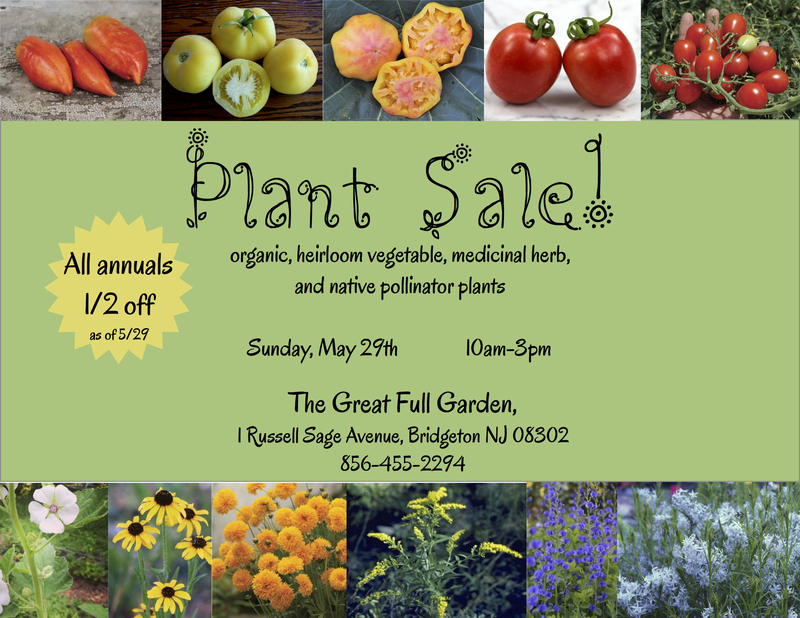 On Sunday, 5/29 there will be a Plant Sale and Garden Tours at my house starting at 10am. See details and projected availability below. At both events I’ll also have my full life of herbal health products, including gift baskets! 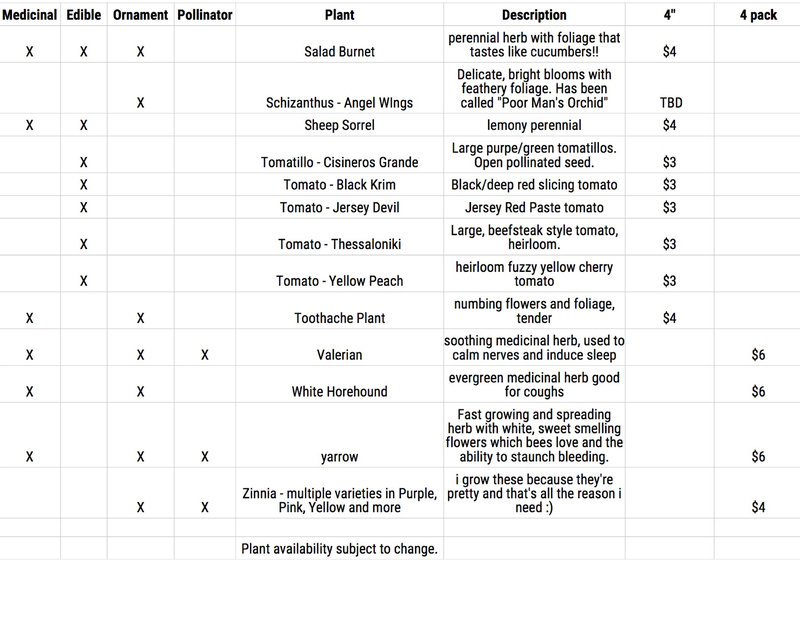 I’ve finally done it, I’ve gotten my plant availability for summer gardens UP. Take a look and let me know if you can make it to any of the events I’ve got on the calendar. If not I’m more than up for showing off my garden, dropping of some plants, or some other plan to get these babies planted. Also keep coming back, I’ve got a lot of great native perennials still on the way. So earlier this week I posted a plant availability graphic and realized today that I didn’t include PAW PAW! I have, for sale, about 10, 1 year old PawPaw trees. They are in pots and I know that summer will not be kind to them, so in an effort to sell them quickly to good homes I am releasing them to the public for 10.00 a piece. 2 for $15. Community gardens, get in touch, it’s possible I’ll just let you have them for free! 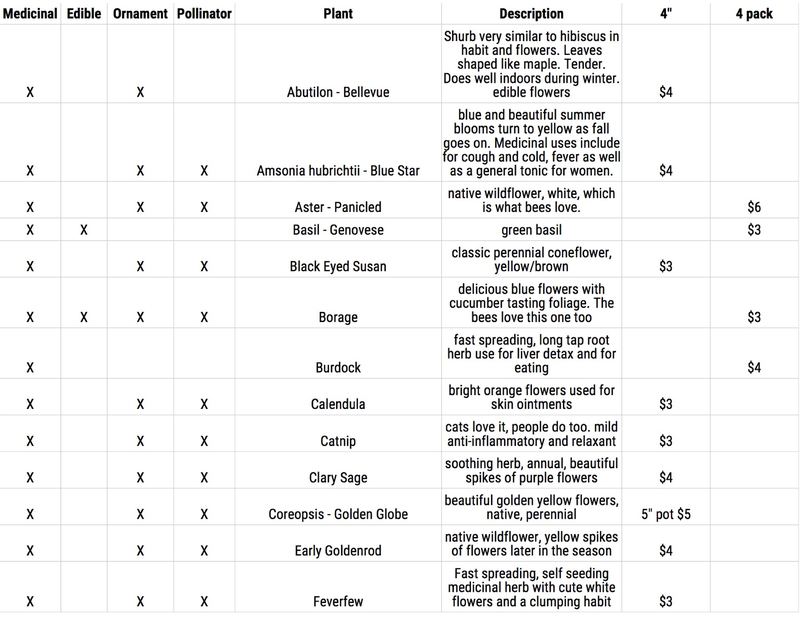 I also can part with a few already stratified seeds for anyone who is interested. These trees are fantastic for the small, home-grower. Reaching an average height of about 25 feet, PawPaw is a tropical fruit cousin which is native to the temperate forests of the Northeast United States, extending out to the midwest, east of the Mississippi. Local culture has latched on to the PawPaw in various ways, most notably, the PawPaw festival in Ohio which has been going on for decades now!! The PawPaw seeds I sprouted were given to me by my good friend and soul sister, who uses only organic practices (same as me–like I said, soul sister). She grows in South Jersey too…so these trees would be extra-acclimated to the environs of Cumberland and possibly Atlantic counties. They ripen in September. So why do you want a PawPaw?? Well, it bears repeating that this tree stays a manageable size. Despite that, the fruits are the largest of any Native fruit tree. Slightly larger than palm sized, they always reminded me of the Ataulfo mangoes in shape/size. Texture also, is reminiscent of a mango. Though instead of one fibrous seed-pod-thingy in the middle there are 3, or likely more, lima bean sized, brown seeds. For me, this makes the PawPaw easier to prepare than Mango. The inside is sweet and custardy, and has that banana-mango-tropical taste that we’ve come to associate with some of our South American favorites. Another reason I like PawPaws goes back to their being native. Seriously. I just left 10 of them out in pots through a Northeast winter (okay, yes, it WAS a mild winter…but still!) and they were fine! They’re not asking for any special treatment. They don’t need pruning. They’re not susceptible to too many diseases.They grow naturally in forests all around, with no human intervention. I mean the ease of care here is beginner-level, for sure. The hard thing about PawPaw? Germinating those seeds!! They need a period of cold strat, for like two months!! And even then germination is spotty. Also they’re persnickety when it comes to their root structure. Transplanting them from the wild very often just does not work. That is because PawPaws create extensive root systems like runners beneath the ground. Severing one from it’s familial network, which it relies on for much of it’s resources, it very likely to result in death. If you would like to purchase a PawPaw get in touch. 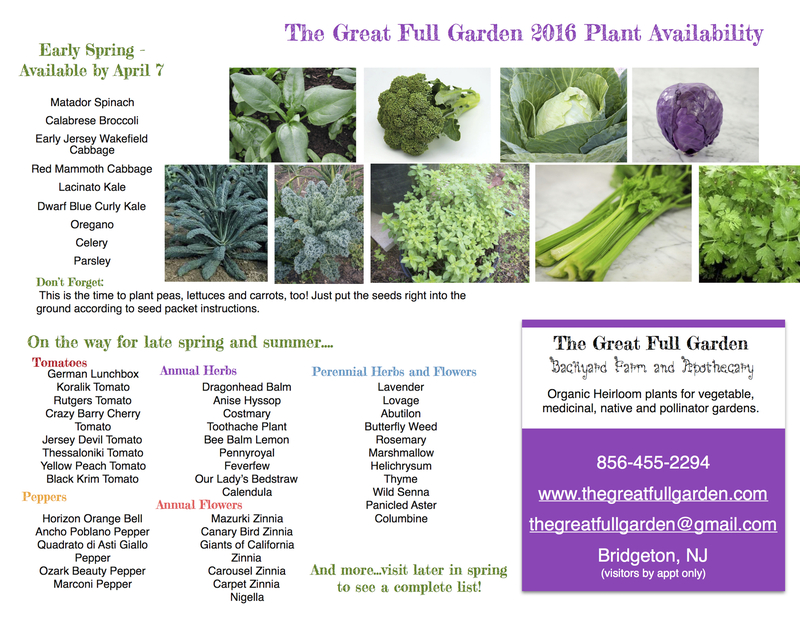 I can be reached at 856-455-2294 (It’s a home phone # so don’t expect a receptionist-like greeting) or email at thegreatfullgarden@gmail.com. 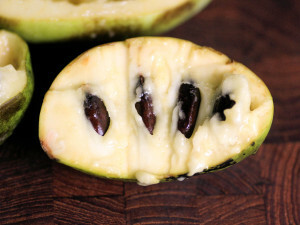 The inside of a paw-paw fruit. I lifted this photo off the blog Serious Eats, which credits the photo to Samara Linnell. The blog post is excellent and gives lots of uses for PawPaw fruit!! Serious Eats blog post on PawPaw. Spring events are among my favorite because so many people come out with the hope of great, full gardens shining in their eyes. I get to talk plants. All. Day. Long. To beginners and Master Gardeners. It can be tiring, but every.single.time it affirms that what I’m doing is what I love. So here is the lineup for this Spring. 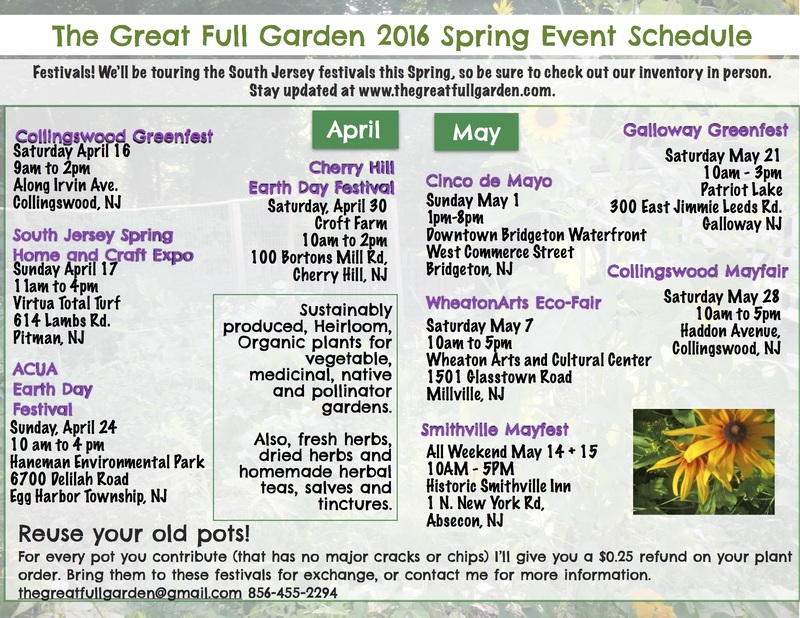 It’s a big list of lots of the bigger eco and craft festivals in South Jersey. So basically, it’s a list of FUN! It’s the end of December, we’ve had a couple of frosts and I’m looking at the Calendula which is still sending up new blooms. Its pretty yellow flowers are a delight this time of year, when everything else has begun to droop and turn brown. Right now in the garden it’s green, green, greens. Kale and flowerless Yarrow. Sage and lemon balm. I’d never curse these plants for staying the winter with me, but nothing shines in the winter morning rain like Calendula. It’s this time of year that I look at the flowers longingly, wondering if I should sacrifice this last burst of sunlight turned flower to the herb closet (which is my version of a hybrid medicine cabinet/spice rack). My first experience growing Calendula was for a client’s garden. He wanted an herb garden that was colorful, something to decorate the space around his bird feeder. I created a bed with native perennials like Echinacea, Bergamot, and Columbine and then sprinkled the annual Calendula seed with hopes that lack of irrigation on that side of the house wouldn’t be a hinderance to their germination. Within a couple of weeks I started to notice the Calendula plants coming up, and within a few more weeks the first flowers. Calendula’s sunny and prolific flowers were my favorite fling that spring. It seemed to lose vibrancy in the summer, but by summer’s end, when cooler weather set in, the plants were back and blooming. My fascination with Calendula intensified after I started growing it in my own garden. It’s brittle, in a juicy, fleshy way. Calendula’s foliage and flowers come off with a snap. It is tender and it feels as if you could pull the whole plant if you’re not careful. But this sunny plant comes with a rugged constitution. Pulling flowers and even foliage only spurs this plant to produce more, faster (though, as a rule, don’t pull off more than 1/3 of any plant you’re harvesting from). And humans have responded to its ability to keeping popping out flowers. We use it for everything, and multiple studies have found that not only is it good for us, but it’s good for the soil. Calendula flowers are a safe and sought after ingredient in self-care products and herbal medicine. It’s best known for it’s ability to soothe skin inflammation and irritations. It is indispensable in my medicine cabinet as a relief for diaper rash and chapped skin. Paired with other herbs like plantain and comfrey, it helps soothe skin back to health after bug bites, rashes, bruises, scrapes or minor burns. Calendula is also an antiseptic, helping to prevent infection and encourage healing. 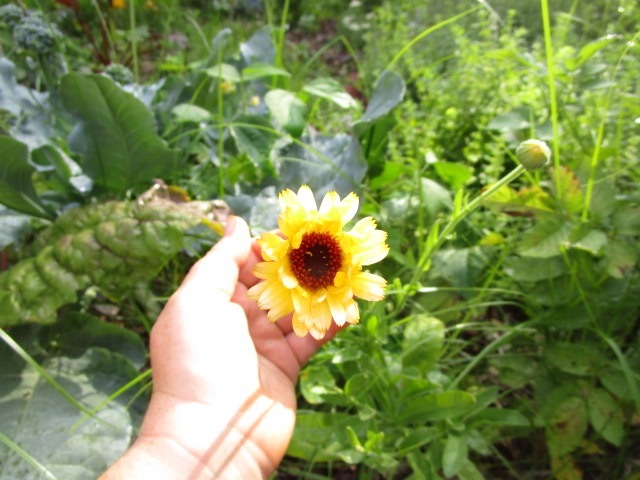 Since planting it, I have learned a lot more about Calendula and how it helps me holistically manage the garden. Calendula repels many harmful insects, such as tomato hornworm, aphids and my official nemesis: cabbageworm. Interplanting Calendula helps the garden be a place where pest control becomes about creating a natural diversity which serves as a check to pests which might otherwise be an issue. Calendula is also a powerful ally when it comes to soil remediation. Multiple studies indicate that Calendula has a place in phytoremediation efforts, or, the use of plants to clean polluted soil. Calendula has been shown to pull up and process cadmium, cesium, chromium and even lead. One promising study showed that Calendula pulled between 96 and 99% of lead out of contaminated water in a hydroponic setup after 15 days. There is further research that identifies Calendula as one of the best candidates for cleaning chromium out of the soil, as this heavy metal does not seem to have as detrimental effect on calendula as it does on other remediating plants. This movement toward plant-based soil remediation is especially important in low- budget operations for community gardens in urban and industrial areas to remediate the soil for safe use. While writing about soil it’s also important to mention that Calendula, aka Pot Marigold has also gotten a reputation for repelling nematodes, just like the French Marigolds that are very popular in vegetable gardening. It has shown to be especially useful in repelling root knot, a condition which is directly due to parasitic nematode larva taking up residence in the roots of plants. Delightful flowers, ease of growth, the promise of healthy soil and the benefit of medicinal attributes give Calendula a permanent home in my garden and medicine cabinet. We’ll be selling plants in the spring if you’d like to give this long-lasting garden companion a try in your medicinal, vegetable or ornamental beds. It comes in a variety of hues ranging from burnt orange to bright sunny yellow. We also sell salves with this gentle but potent healer infused in organic olive oil. 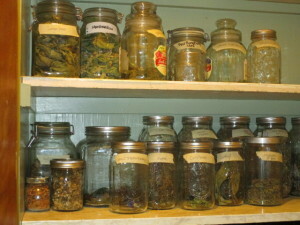 Check out my pages on Herbal Health to try them out. Anybody doing any last minute shopping? Looking for a last minute gift basket? I’m running a special on handmade Jute and Wool baskets, in different sizes. Small baskets have 3 products in them, come with a 4 inch diameter homemade gift basket that includes 1 salve/oil, 1 tea and 1 tincture of your choice for $20. Medium baskets have 5 products in them, come with a 5 inch diameter basket which includes 2 salves/oils, 2 tea and 1 tincture of your choice for $30. Large baskets have 7 products in them, comes with a 6 inch diameter basket and includes 3 salves/oils, 2 teas, 2 tinctures and are $40. Listing of products available on website. Save time and money on shipping for pickups local to Southern New Jersey! Please order directly with me, via email (thegreatfullgarden@gmail.com) or phone (856-455-2294 NO TEXTS) as my website shopping cart has been acting crazy!! To me, the coolest part about it is that wordpress has an awesome little function that allows this logo to be seen in the tab of your browser…that’s pretty fun. We’re embarking on a new product line here at The Great Full Garden…and like most things I do, it comes with a story. The only science project I ever put all my heart into was one I failed miserably at. The thing is, in 5th grade, the internet was just beginning, and perfumery books on a 5th grade level were not plentiful in my tiny town…so I did the best I could, and experimented with boiling different flowers in water. I came up with some interesting brown waters. None of them smelled like anything in particular and I felt like a failure. I don’t even remember what grade I got because the grade didn’t matter. I went into the project thinking I was gonna end up with THE great new fragrance and when that didn’t happen…my little 5th or 6th grade heart stopped. I pushed that memory of failure deep down inside. The next year I did something on Solar Systems…it was good, got an A, I felt successful yadda-yadda-yadda…but the solar system project lacked passion. It lacked experimentation. I knew it did, but I just wanted to feel like I had done something WORTH doing. As an adult I bring up that memory as I sit in my kitchen trying out different salve combinations. What feels too oily, what doesn’t last long? If I take this catnip tincture right before bed will my arthritis not bother me as much? What about the milk thistle. And so that’s the point of this post tonight. I have reawakened my 5th grade soul. I’m dabbling and mixing. Smelling, pouring, shaking. I’m having a great time and there’s no real deadline. I’ve got the internet, more access to books, access to different ingredients, including alcohol, which is actually pretty important if you’re going to be extracting plant “stuff”–yes, that’s my scientific term. The result of this new found love is that I’ve got some awesome salves, some tinctures and some tried and true medicinal teas for sale. The herbs are locally grown, the oils are organic, and I’m working on sourcing organic alcohol, in bulk, for a decent price…because right now the local liquor store just thinks Geoff (my husband) is REALLY into Everclear. I’ll be getting a list together soon, and keep an eye out for the events page to keep track of where I’ll be throughout the month. These are way better than my 5th grade, limited ability, no-smell perfumes. I’ve got a powerful medicine tea which I turn to in case of exposure to sickness, or actual sickness. I’ve got catnip tincture, milk thistle tincture, feverfew tincture…I’ve got a calendula/chamomile/comfrey salve that’ll work equally well on dry hands as it will on chapped baby bottoms. I’ve got lip balm and I’m working on a tinted version. I feel like a mad scientist. Except it’s all about love. Crazy love scientist…that’s me. Just the beginning, I’ve got waaay more things brewing since this was taken. It took me a few years to get a fall garden going. Every year I THOUGHT about it, but it just never happened. I might harvest a few loose beets, or keep my kales, collards and chard going until frost. But to replant peas? Replanting all the greens? Lettuces. Resowing some last minute sunflowers and marigolds? Never happened. So actually getting down to the nitty gritty of planting a fall garden was intimidating. But I knew if I ever wanted to taste brussells sprouts kissed by frost (cause that’s what they need to taste best) then I needed to buckle down and start some seeds…mid-august. When it’s hot. Like, really hot. All winter when starting plants I worry about how I’ll keep them warm enough to germinate. In the summer, it’s about not letting the heat bother those little plants so much that they become leggy. Which means shading them. Which also runs the risk of them becoming leggy. So I ignored my irrational fears of failure for the fall garden and I figured out that they are just as easy to start as a regular ol’ springtime garden. The key here is timing. Because even though it’s hot, with a little care you can avoid losing plants to the heat. What you can’t avoid (without a greenhouse or cold frame) is the KILLING FROST. It’s as dangerous as it sounds. So being two weeks late on sowing seeds for fall harvest is just not acceptable. Good timing is your savior for the fall garden. This year I’m sowing ton of greens, chicory for springtime flowering as well as marigolds and sunflowers that will hopefully give me some color all the way to Thanksgiving (a girl can dream, right?). 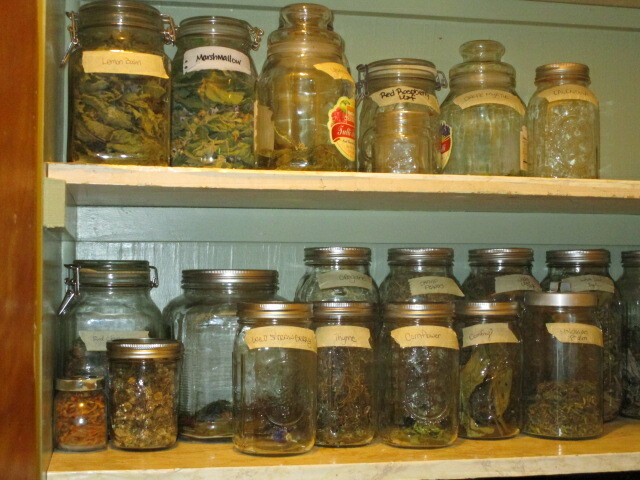 Also, more calendula and chamomile for some medicinal tinctures and salves. (I’ll write more on that soon.) Lastly a burst of annual herbs like fennel, basil, tulsi, dill, cilantro and more, to stock my kitchen before winter really sets in. 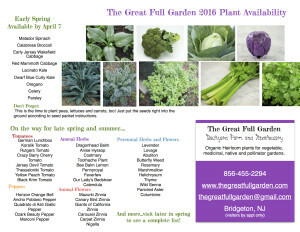 Jamie Warner on Ready for your Spring Garden? Buddy on Ready for your Spring Garden?